I’ll take six of those, please. LOL that looks terrible. I’d much rather have a deagle grip. OBVIOUSLY. Why would *anyone* sully a 1911 by making it part of an AR-15 lower. Was thing a kitchen gunsmith thing, or is someone making these? 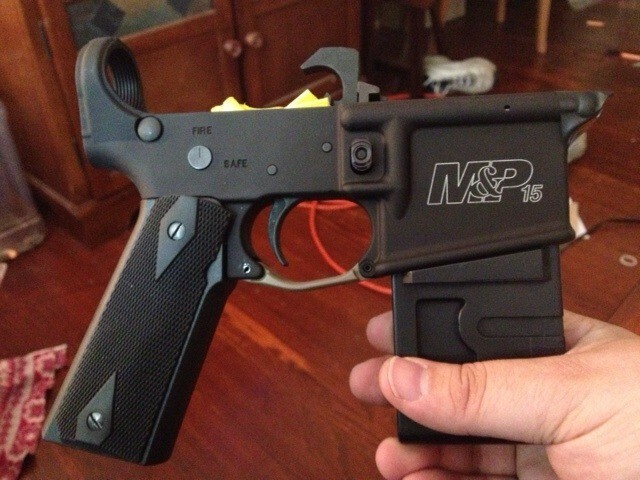 It is a real thing and is made by Pearce Grip for about $15 bucks. The left side grip however will need some modification to allow the safety lever to function correctly. This is an awesome idea !! I run home and try this, and then I’ll say if I prefer the classic M16-M4 grip. ok, but where’s the one for the AK? Or does that get a Makarov style grip? You’ve been able to buy 45 grip blocks for M16 mounting lugs for easily over a decade. Pearce makes one, and various paintball accessory outfits made them as most of the early paintball guns used M16 (AR) grip mounts. Ive got a euro style (similar to an HK) grip on mine, came from a paintball gun. That looks weirdly comfortable. I might unironically want one. Amazing the rifle starts to rust and jams on the first pull of the trigger. Now you can buy grips for yo grips Dawg! Insert Xzibit Meme here. What, no Ed Brown Bobtail conversion? I ran a similar setup on my first AR, using the grip from a CCI Phantom VSC.